Are you looking for affordable unlimited Talk N Text promo? You’re in the right page if you’re searching for more details for unlitext in TNT. For only 10 pesos you can already register or subscribe to non-stop texting on the same network, to Smart and Sun Cellular valid for 2 days. As long as you have cell signal on your location, you can text all your friends and love one all day and night. 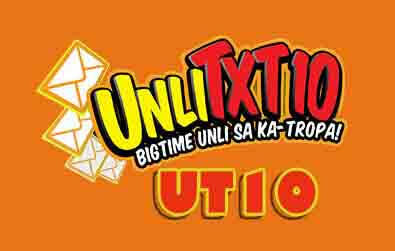 The good thing with UT10 promo is that you can extend it for one or more days and even weeks for only 5 pesos per day. Registration can be done via SMS or you can also ask if it’s available as a direct load from your nearest retailers. If you prefer thru text, just follow the right format of keyword and access number to text subscribe. Via retailer, to load your customer: just text, UT10(space)11 digit TNT # and send to 4540. If you want to extend this promo just text the keyword EXTEND, choose from the given 3 options, e.g. 1,2 or 3 then wait for the notification message send to your mobile number, If you can reach up to 7 days using EXTEND service, you’ll also have a chance to enjoy free rewards from Talk N Text.